The revitalization of the Lafayette Gardens 450-unit mid-rise public housing site into a true mixed-income urban community represents a strong collaborative effort of the Jersey City Housing Authority, the City of Jersey City and community residents. Core to the project was the desire to integrate a full range of housing options—low-income, moderate-income and market-rate—into a neighborhood experiencing strong market pressures due to its location along the Hudson Bergen Light Rail Line and several major transportation routes serving downtown Jersey City and New York City. 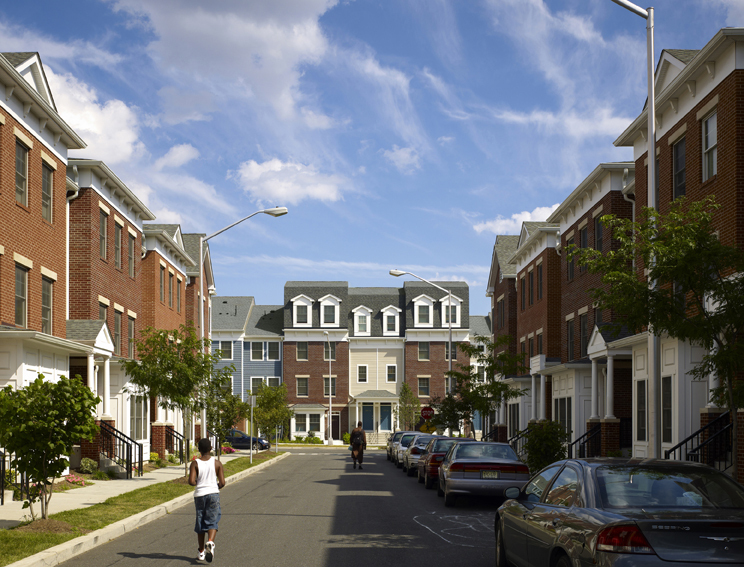 The redevelopment effort began with the Housing Authority procuring Michaels Development Company as development partner, along with Wallace Roberts & Todd, LLC as the master planner and primary architect, to create a master plan for the Morris Canal/Lafayette Park neighborhood. This plan had two principal components: revitalization of the Lafayette Gardens public housing project, to be completed in six phases, and redevelopment of a former underutilized industrial property, to be completed in one phase. Both sites are in close proximity to Liberty State Park, as well as a vital mixed-use neighborhood centered along Communipaw and Pacific avenues. Both sites are served by excellent bus, rail and ferry access, as well as a new nearby charter school, and both fall within the Morris Canal Redevelopment Area, furthering the objective of the plan. 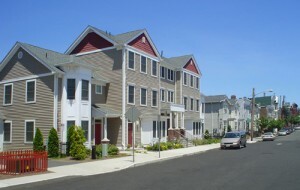 A total of 209 mixed-finance, mixed-income units have been built—72 stacked townhouses on the former industrial site and 137 stacked townhouses and flats in the last two phases built on the former public housing site, which complements an 83-unit senior building constructed in a previous phase. The townhouses and flats comprise one-, two-, three- and four-bedroom apartments in a compact urban form. Community support spaces have also been constructed on the public housing site. Four townhouses are located over a portion of this community support space in keeping with a goal of maximizing project density. Several buildings have been designed especially to fit the neighborhood street pattern, including angled street intersections, and to respect the alignment of the former Morris Canal, which passed through the site and is recognized though interpretive signage and paving design. An additional 59 one- and two-bedroom affordable senior rental apartments with on-site services are now under construction on two additional off-site parcels, and future plans call for 127 one- to four-bedroom mixed-income family rental townhouses, as well as seven three- and four-bedroom affordable for-sale homes on an adjacent parcel. Employing city acquisition funds for the industrial site and federal HOPE VI and Jersey City Housing Authority capital funds for all of the phases, the development team was able to leverage additional funding, including Low Income Tax Credit Equity, New Jersey Department of Community Affairs Balanced Housing Funds, CDBG Grants, Federal Home Loan Bank Affordable Housing Program Grant, Jersey City Affordable Housing Trust Fund and private financing. The $64 million budget for the last three phases provides housing choice that ranges from very-low income to market rate, and provides access to a social services coordinator, property management services, computer training facilities, exercise facilities, community laundry space, resident meeting space and social committees.